It shouldn't be illegal to drink paint, just to drive under the influence of paint. I thought I remember something about how walmart wouldnt sell too much glue to minors. Homer Simpson like the flavor purple in his donuts, so I'm gonna go with purple. 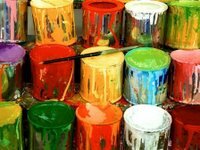 If it was commonplace for people to purchase special health insurance to cover injuries related to the consuming of commercial paints, then it would probably be illegal to drink paint. Incorrect, we have already established that thinking you are a bear and trying to live and pet wild bears is not insane, so drinking paint would not be either. by the way this is your best post ever.